My kids love LOVE yogurt and we have always turned to Yoplait for our yogurt needs. I find that when they eat more yogurt they are not as sick as often. 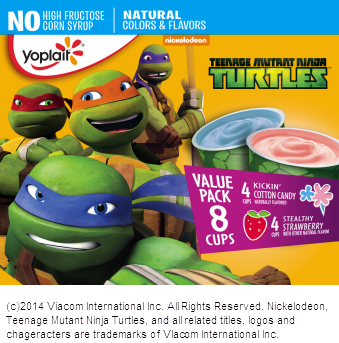 Yoplait has come out with 2 new favorites for kids. 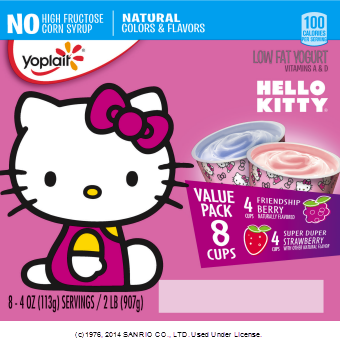 My oldest son loves Hello Kitty and has been eating yogurt since he was able to eat solids, so you could only image his excitement when he saw the Hello Kitty package. He even went to cleaning the cups and keeping them using them for little projects and such. 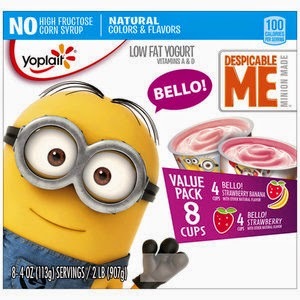 My daughter's also loved the Hello Kitty but they are also big Minion fans and they love Strawberry Banana. And last but not least the Teenage Mutant Ninja Turtles or TMNT my boys went crazy for these. Especailly with the release of the movie, they are all into TMNT's. I love watching characters from when I was a kid making a come back and being just as popular as they were when I was young. Remove foil covers from yogurt cups. Add a few drops of gel food coloring to each yogurt cup, making some green and some blue. Mix until desired colors are reached. Add 1-2 tablespoons club soda to each cup and stir carefully to combine. Place a straw in each cup and serve immediately or refrigerate until ready to serve. Each new Character has the same great flavors your kids already have come to know and love but now adding in the fun of there favorite tv cartoons. I have yet to be disappointed by Yoplait products they seem to keep finding ways to keep my family happy and healthy.